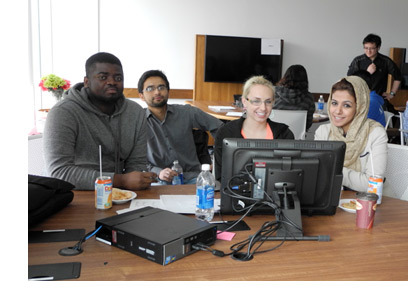 Approximately 20 undergraduate and graduate business students participated in the Canada Revenue Agency volunteer program on Friday, April 12. They assisted in the electronic preparation of more than 110 tax returns for their fellow students within four hours. The Faculty of Business, Student Services and Integrated Technology Services at UNB Saint John have participated in this program for over 13 years. It has proven to be a great service to our students while also providing a wonderful learning and outreach experience for our volunteers. This year was extra special as we were able to organize this event in the state-of-the-art BMO room in the new Hans K. Klohn Commons at UNB Saint John.